Boasting a refined interior with low and warm lighting for a sophisticated ambiance, Gyuu+ Yakiniku Grill’s dark wood theme and personal dry aging room reminds us of high-end yakiniku restaurants in Japan. Yes, this is the place to impress your significant other and business associates. Signature dishes include A5 Miyazaki Shin, USDA Sirloin Steak, USDA Prime Sirloin, Kurobuta Pork Rosu Steak and Pork Shoulder Tare that are air-flown all the way from Japan, Australia and U.S.A. 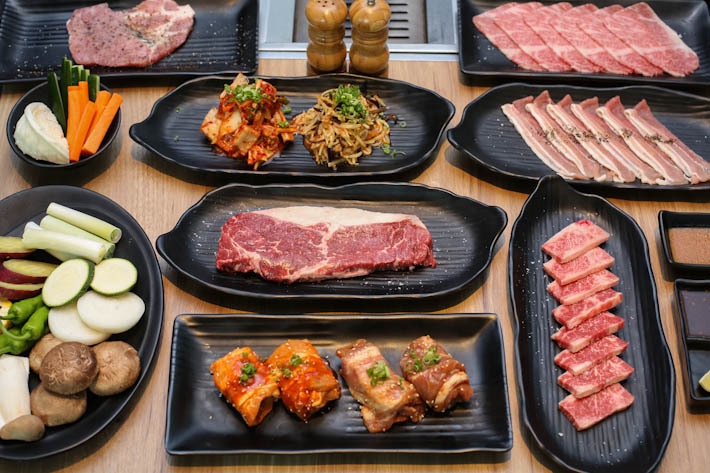 If you think all that premium meat sounds heavy on your wallet, rest assured that prices are kept affordable as Gyuu+ Yakiniku Grill leverages on Emporium Shokuhin’s direct sourcing means. Top-notch Japanese beef at lower prices? We are sold. Seafood lovers are not neglected too—the restaurant gets its selection of live lobsters and crabs from the tanks at Emporium Shokuhin. Tasty a la carte options you have include Hon Maguro Steak (S$18++), Madai Fillet (S$16++), Scallops (S$18++) and Prawns (S$13++).